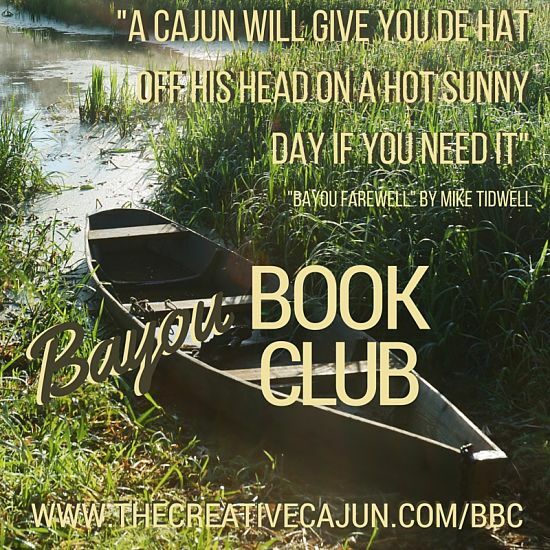 I’ve been re-reading a favorite book of mine – “Bayou Farewell” by Mike Tidwell in preparation for our Bayou Book Club call this Sunday evening. The book focuses on the erosion of the coastal wetlands of South Louisiana and the culture of the people who live in that region. Mr. Tidwell weaves an interesting tale through his journeys with the colorful individuals he meets while traveling through the region. One thing that I love most about his writing is how to describes the culture in an entertaining, but respectful way. As a native Cajun, I’ve seen all too often how the culture has been characterized as an out of touch, simple, rustic and uneducated bunch of hillbillies eating snakes in the swamp. It’s refreshing to hear someone describe our culture in a manner in which is it valued. Cherished. Appreciated. In the past few weeks, it’s dawned on me that this isn’t the most positive, warm, fuzzy book I could choose as our inaugural book club selection – the title even alludes to that sadness due to the inclusion of the word “farewell”. I started to think of a more upbeat selection for next month and it became apparent to me that the history of the Cajun culture is one of sadness. From the initial expulsion from France to Nova Scotia, then being exiled from Nova Scotia and settling in a swampy region of South Louisiana – the history of our culture is inherently a sad tale. After a few days of reflection, I reason that our ancestors did the best with what the resources they had given the situations they encountered. After settling in South Louisiana, they quickly began to adapt to their new environment and thrive by learning to live off of the land. As we know, they were resilient in the face of difficulty and resourceful in building new lives. Our culture is also characterized by our sometimes fierce independent spirit. Considering our history, that’s completely understandable to me. I am not surprised that we’re also distrustful of governments and corporations – we’ve suffered from broken promises and heartbreak in our history at the hands of both. While the history of my ancestors is littered with sadness, it’s encouraging to me how we’re also known for our joie de vivre. We are a lively bunch who is appreciative and grateful for what we have. The sadness in our history combined with the fact that we’re known around the world for our joie de vivre is the perfect summation of what makes our culture so special. We don’t dwell on our past and wallow in our pity. We gather ourselves, keep moving forward and put our best foot forward each day. We’re hard workers who make the best with what they’ve been given and are relentless in their work ethic. What does sadden me, though – is how we feel so powerless to rectify he disappearing wetlands. It strikes me as a hopeless feeling – a feeling of being all alone and that no one cares. I understand the hopeless, powerless feelings. I am not ashamed to admit that I feel that way, too. I do believe that many people in the rest of the country are unaware of what is going on in South Louisiana and the effects that this will have on the rest of the country, not just on the immediate area. It is my intention to work to bring this issue to light – to fund those groups and support the efforts of those who are helping to bring attention and resolution to the issue of wetland loss + restoration. My product prices will include a donation to efforts to restore the wetlands and I will clearly communicate the recipient and amounts of each donation. It is important to me that I do everything that I can to preserve not only my culture, but the wetlands of South Louisiana. I’ve been aware of the issue for years, but I always felt powerless to do anything to resolve the issue. I am now choosing not to feel powerless and I will take decisive action. I will do what I can with what I’ve been given to contribute to a solution. I hope you’ll join me in this effort. No one can fix this alone – one voice screaming for help will be far less effective than a group of voices gathered together – in a coordinated effort. I’ve contacted individuals at the Gulf Restoration Network – an agency I supported back in 2010 during the BP Oil disaster and I hope to report back soon with ways in which we can all contribute to the efforts to preserve and restore the wetlands. Stay tuned for more details – coming soon.